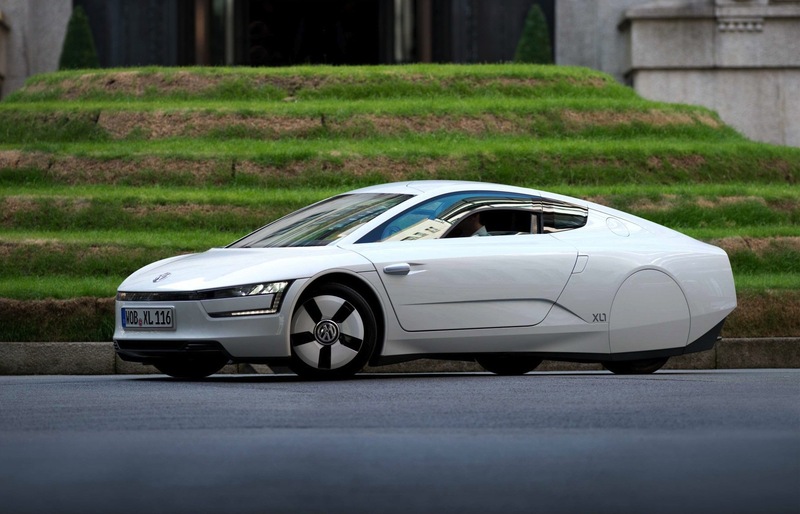 If you didn’t already know, that’s the Volkswagen XL1, currently the world’s most fuel-efficient hybrid car in regular production. EngageSportMode isn’t usually a fan of eco-cars, but the design details of the XL1 mean that it feels less hair shirt and more Nomex overalls than most. Take, for example, the chassis construction. Unlike regular road cars, it makes use of a carbon-fibre monocoque structure, something usually seen on high-end hypercars or, alternatively, Le Mans prototypes such as the Audi R18 e-tron. It also has gull-wing style doors which are not only cool, and practical, but again are also very similar to it’s Le Mans racing cousin. Use of other featherweight materials, such as polycarbonate for the side windows, means the XL1 tips the scales at just 795 kgs; over 100 kgs lighter than the R18. Whilst the lightweight aerodynamic bodyshell is important, the real economy engineering comes in the form of the powertrain. A mid-mounted two-cylinder 800 cc turbo-diesel engine (producing 46 bhp) is connected to a 27 bhp electric motor via a 7-speed dual-clutch gearbox. Again, all of this sounds very similar to the Audi R18 e-tron in design, if not in power output at least. With the TDI and E-motor singing together to give maximum turning potential, the XL1 will hit 62 mph in 12.7 seconds, all the way to a limited 100 mph. Granted these might not be staggering performance figures, but when you consider the minute scale of the engine, it’s actually quite remarkable. Plus, as we said earlier, this isn’t a performance car but an economy car – fortunately something the XL1 does very well. Using the plug-in hybrid in purely electric mode gives a range of 50 km, which can be extended by using the diesel engine to allow up to 500 km of travel. Most significantly, are those mile per gallon statistics: an official combined figure of 313 mpg! For comparison, a Toyota Prius can only give 72.4 mpg. We can’t discuss comparisons with the R18, but the XL1 probably wins. Everything on the XL1 has been designed to minimise weight and maximise efficiency. For instance, when was the last time you saw a car without power steering? I can’t remember either, but the XL1 does without electric or hydraulic assistance for turning the wheels. With so little weight, and skinny 115/80 R15 tyres up front, there’s no need for assistance. The fact that the wheels themselves are made of magnesium, a common race car part, probably helps too. In another nod to the R18, carbon-ceramic disc brakes are used all round. They also help harvest extra energy for the electric motor’s battery whilst making you stop. Internally things are, slightly, more normal with a dashboard familiar to anyone who has been in a Volkswagen Up! recently. Although I don’t remember the Up! having a dash made of wood-fibre material or being covered in a carbon-fibre style trim. The strictly two-seater is set up with the passenger’s carbon-fibre framed chair positioned slightly further back than the drivers to maximise space. So kind of two-thirds of a McLaren F1 maybe? Right now the XL1 is slated for a limited production run. Just how limited, and what the price will be, are yet to be confirmed. Estimates range from €50-100k which is expensive for a tiny city-car, but a positive bargain compared to a Le Mans racer. I also don’t recall Audi mentioning the R18 e-tron having 120 litres of boot space, unlike the VW. EngageSportMode genuinely loves the XL1. It proves economy needn’t be boring or a chore, and packs a ridiculous amount of technology into a car smaller than the Polo. Right now it may be an expensive limited-edition, but you can guarantee the ideas encapsulated within the XL1 will filter down to the rest of the VW range quickly. It’s also the closest you’ll ever get to a Le Mans Prototype on your drive too! All images © Volkswagen UK Press Office for editorial use only.